If you try adding terms up on a calculator, this scarcely seems possible! By the time you have added the hundredth term, you will have a reached only a whopping 5.187… (and each new term will be less than .01). After adding up a million terms, you will have made it only to about 14.39272672… — and each new term will be less than .000001. Does the series really diverge? etc. So the result of adding up the first 2n terms 1/2 + 1/3 + . 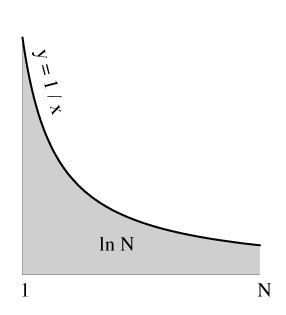 . . + 1/2n is at least n/2, and in particular, can be as large as we please. But this does take a long time to get anywhere. To add up to, say, 100, Bernoulli’s proof shows us that 2198 (about 4×1059) terms will suffice. But maybe this is more than we actually need. 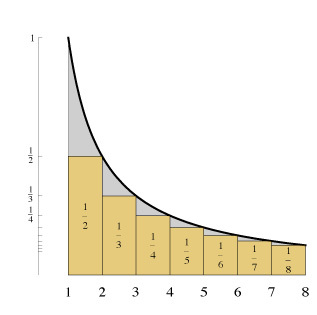 A basic fact from calculus is that the area under the curve y = 1/x, from x = 1 to x = N is exactly ln N.
Now the area of a box 1 unit wide and 1/n units tall is 1/n, and boxes of width 1 and heights 1, 1/2, 1/3, . . . altogether have area 1 + 1/2 + 1/3 . . .
1 + 1/2 + . . . + 1/n is between ln (n+1) and (ln n) + 1. So to be sure that the series sums to at least 100, we can be sure that e100-1 (about 2.7×1043) terms will suffice! So the sum of the first million terms is about (ln 1,000,000) + γ, and if we want to sum to 100, we need to have n such that ln n + γ is greater than 100; in other words, e (100 – γ) (about 1.5×1043) terms will do. The series Σ 1/(n ln n) diverges even more slowly still, taking about e^e^n terms to sum to n (!!) The series Σ 1/(n (ln n) (ln ln n)) takes e^e^e^n terms to sum to n. Etc!! Incidentally, our post BM. An astronomical cost! also involves the harmonic series and some close relatives. This is how I was able to make rough estimates of the number of bananas required, without using a calculator! It seems to me that a natural assumption would be that when the rope is stretched, that it is stretched uniformly. The discussion seems to assume that only the part stretched is the rope in front of the worm with the position of the worm being fixed, i.e., after the rope is stretched to 2 m the worm is still at 1 cm instead of being proportionally stretched to 2 cm. Taking into account this additional boost leads to the recursive position at the start of each second: p(0) = 0 and p(n) = (p(n-1)+1)(n+1)/n with the length of the rope l(n) = 100(n+1) where all of the units are cm. Is there a nice closed form for this recursion? 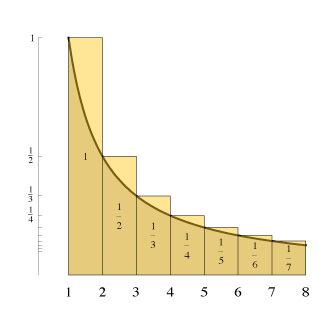 ok…but what is the practical meaning of harmonic numbers? are they numerical representations of wavelength and frequency? or are they resonant frequency math expressions? for example what does 1.3333 mean in terms of the real world…. how does pi relate to harmonic numbers?